They're only young once, so don't delay until after all of those precious years have passed. Now is the time to enjoy all the fun! 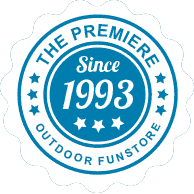 Make lasting memories in the back yard with the highest quality brands in outdoor fun today! What is the maximum you can pay monthly? Give us a call today and receive a free estimate on your outdoor product of choice. Ask about our Rainbow Playsets, Vuly Trampolines, and Goalrilla & Goalsetter Basketball Hoops. With our 5-star financing system, you can be enjoying those beautiful moments today!